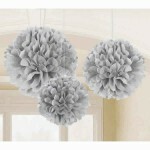 Rounded Silver Fluffy Decorations add a sweet and elegant look to your party space. These hanging decorations are made of silver tissue paper with a shimmery look that extends out to whimsical round fluffs. Use the included ribbon to display the tissue paper decorations from doorways or ceilings to celebrate the special day. Silver Fluffy Decorations are perfect for a birthday party, anniversary, bridal shower, or any silver-themed celebration.